Chennai, May 25 : Former president A. P. J. Abdul Kalam has called for drawing up a workable research document for marketing space solar power to space-faring nations in six months. "Within the next six months, we need to bring out a workable research document for marketing space solar power to space-faring nations," Kalam said Friday at the 32nd International Space Development Conference (ISDC) in his acceptance speech on receiving the Wernher Von Braun Memorial Award in San Diego, USA. The event was organised by National Space Society, the US. A copy of his speech was mailed to IANS here by Kalam's advisor. Mumbai, March 11 : Former president A. P. J. Abdul Kalam Monday said there was a need for creating an educational system that highlighted the importance of entrepreneurship. "In the present context, the education system has to be designed in a way that produces large number of employment generators and not just employment seekers," Kalam said while addressing students on the 54th foundation day of the Indian Institute of Technology-Bombay. To achieve this, he said, there was the need for a strategy that could make education more attractive, skill oriented and employment generating. The Care Hospital group has launched its new `Out-patient Centre', which is the first of its kind in the country, at Banjarahills in Hyderabad. New Delhi, Jan 30 : The year that has gone by has been one of worst in my memory. Every morning when one opened newspapers, the front page was filled with reports of scams and scandals, and demonstrations by people protesting against the government, which created doubts about the system that we have adopted to govern the country. To crown all the scandals, the year closed with doubts being raised against us as human beings: that we are incapable of respecting women of the country, mothers, sisters and daughters. Days after a visit by former president APJ Abdul Kalam to the Kudankulam Nuclear Power Project (KNPP) in Tirunelveli district in Tamil Nadu, the support for the government's plans to finish the construction on site has grown. Kalam has assuered protesters that plant is safe and does not face a threat from Tsunami. He expressed satisfaction over the safety measures put in place by operators at the plant. Many are now questioning the views of S P Udayakumar, a lead man behind the protests in the area. Assurances given by the former President of India, APJ Abdul Kalam regarding the Kudankulam nuclear plant have failed to convince villagers protesting against the Kudankulam Nuclear Power Project (KNPP) in Tirunelveli district in Tamil Nadu. 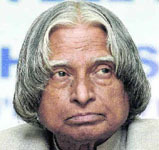 Kalam had visited the site on Sunday and said that the plant is safe and does not face a threat from Tsunami. He expressed satisfaction over the safety measures put in place by operators at the plant. Giving a sigh of relief for all the diabetic kid and their parents, former President APJ Abdul Kalam, popularly known as India’s missile man, has recently made a very motivating claim. According to him, if a child is suffering from overweight disorder, his parents should not panic because the kid is only suffering a food disorder, which is certainly treatable. However, all these claims were made on the occasion of a diabetic awareness program organized by the by Novo Nordisk Education Foundation. Director Nila Madhab Panda's forthcoming children's movie I Am Kalam, has been selected to be screened at the esteemed London Film Festival, which is starting next month. The movie deals with the story of a poor boy, who is a great fan of former president of India, A P J Abdul Kalam. He is so inspired by Kalam that he starts referring himself as Kalam. On May 12th, the movie had its world premiere at the 63rd Cannes Film Festival at the Marche du Film section. I Am Kalam is set to release in India by December. Lucknow, Dec 22 :Former president A. P. J. Abdul Kalam Tuesday asked students in Uttar Pradesh to emulate a development model he had successfully implemented in Tamil Nadu years ago to bring urban amenities to rural areas. Addressing the 7th convocation ceremony of the Uttar Pradesh Technical University (UPTU)here, Kalam sought to introduce the "Providing Urban Amenities in Rural Areas" (PURA) concept that he had experimented with at the Periyar Maniammai College of Technology for Women in the state's Tanjore district. New Delhi, Dec 9 : Students from across the country have voted former President APJ Abdul Kalam as country’s environment ambassador. The campaign was conducted by an NGO across the country. Union Minister of State for Environment and Forests Jairam Ramesh felicitated Kalam in a programme here. New Delhi, Dec 9 : Former president A. P. J. Abdul Kalam, who was Wednesday nominated as the 'Paryavaran Ambassador' of India, has said the country's development should be kept in mind while negotiating the cut in the green house gas emission intensity. "We are a billion people and we have our dreams. Our development has to be protected," Kalam said at a function attended by Minister of State for Environment and Forests Jairam Ramesh. New Delhi, Dec 7 : Former president A. P. J. Abdul KalamA. P. J. Abdul Kalam Monday addressed a packed auditorium of students in the Delhi University, regaling them with experiences of his student days. Though Kalam was invited by St. Stephens college, students from other colleges also came to listen to Kalam's talk. He mainly spoke on the importance of education and the value of teachers in one's life. New Delhi, Nov 28 - Former president A. P. J. Abdul Kalam has denied that he is appearing in an Indo-French film titled "I Am Kalam". But actor Gulshan Grover insists Kalam "has given a shot as himself in the movie". Kalam's office said in a statement: "Kalam has no plans to act or associate with any film. The news is only a speculation and it is the individual's imagination with a business motive." Port Blair (Andaman and Nicobar Islands), Sep 4 : Former President Dr APJ Abdul Kalam on Friday unveiled a vision document for the strategic development of the Andaman and Nicobar Islands by the year 2020. Inaugurating a national seminar on ‘Security and Development of the Andaman and Nicobar islands’ here, Dr Kalam said that a 250 mw nuclear power station on one of the islands would form the core of the development programme. New Delhi, Aug. 27 : Former President Dr. A. P. J. Abdul Kalam on Thursday rejected senior DRDO scientist Dr. K. Santhanam's claims that the Pokhran II nuclear tests held in the month of May 1998 were partially successful. Dr. Kalam told a private television channel that the tests were successful and that a thorough review of these tests had been taken with Dr. K. Santhanam present. New Delhi, Aug. 12 : Former President A P J Abdul Kalam has said that reading ''quality books'' would lead to a ''knowledge revolution'' in India, and to facilitate that one should spend at least an hour daily for reading books. Addressing a book festival organised by the ''Makkal Sindhanai Peravai'' (People''s Thinkers Forum) on Tuesday, he urged parents to start a mini library in every house so that the great habit of reading can be inculcated in children. New Delhi, July 23 : Reacting to former president APJ Abdul Kalam''s statement that he has not received any communication from Continental Airlines, the US-based airline today said that they want to apologise personally to him. "Since he is not in Delhi, we are waiting for him to return so that we can apologise personally to Dr. Kalam," the airline said. Kochi, July 23 : Former President Dr. APJ Abdul Kalam has said he is yet to receive an apology from Continental Airlines for frisking him at the Indira Gandhi International Airport in April this year. "I''ve not yet received it. Whatever I had to say, I''ve already said it," said Kalam. The statement came a day after Continental Airlines had issued a public apology for subjecting Kalam to a security frisking at the airport prior to his boarding a US-bound flight of Continental Airlines on April 21.